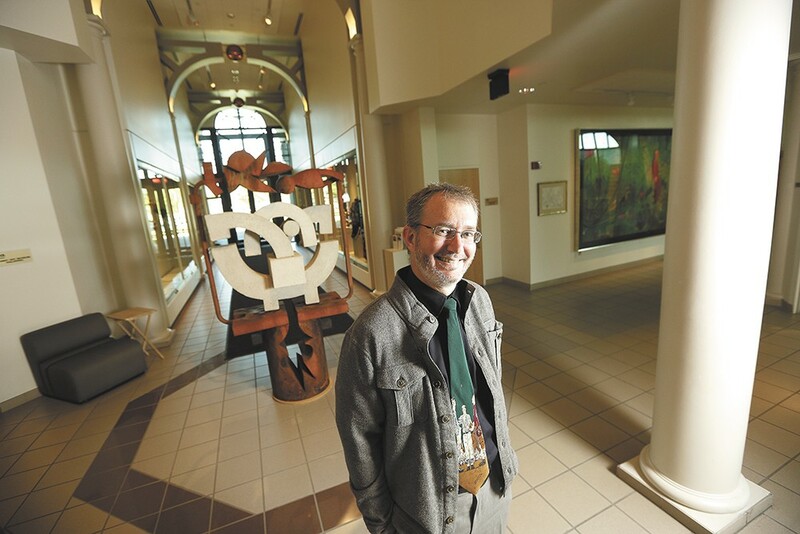 Jundt Art Museum Curator Paul Manoguerra at Gonzaga University. A college campus can be a daunting place for anyone who isn't a student. Navigating a campus map printed off the web, finding legal parking and feeling intimidated by the city-within-a-city often conspire to keep schools and their non-enrolled community members divided mentally, if not physically. The best reason to traverse that false wall might be the intriguing array of visual arts one can find at museums on our Inland Northwest campuses. Colleges and universities can program genre-defying and boundary-pushing exhibitions that might not fly at commercial galleries, and can access their own collections, and that of peer institutions, that make incredible artwork and artifacts available to the region's hard-core art lovers as well as curious dilettantes. These museums are gems — often underappreciated — and program their exhibitions and events with a eye toward their communities as well as their students. Paul Manoguerra, the director and curator at Gonzaga's Jundt Art Museum, says that when it comes to planning shows, his team considers an exhibition's historical importance, its value to teaching and research at the school, "and, is it of interest to the citizens of Spokane and the Inland Northwest?" "Most exhibits we do, we'd like to check off all three as a 'Yes,'" Manoguerra says. "Sometimes the external interest is less important than whatever teaching and learning is happening. Sometimes that trumps being popular ... And sometimes it's better to be popular and get some people in the door." This fall, one Jundt highlight is a massive exhibit called "Roman Myths and Mythmaking," opening Sept. 17, that should be of particular interest to scholars and history buffs. In addition to artifacts from everyday life in the Roman Empire — lamps, coins, statues, gems and the like — borrowed from other museums, there will be a weekly lecture series in conjunction with the exhibition and its objects featuring experts from around the country and Gonzaga faculty. The lecture series is the kind of programming opportunity that is key to stirring interest among both students and community members when it comes to an exhibition, according to Ryan Hardesty, the curator of art and exhibitions at Washington State University's Museum of Art. Coming up with creative "extras" to a show is part of the process of deciding whether or not an exhibition is worth doing. "Of course we ask ourselves, 'Do we have an audience for this exhibition?'" Hardesty says. "Clearly our primary audience here in Pullman is the student body. We look for exhibitions that offer a ton of great programming potential, things that we can build workshops and lecture series and events around easily, because we find those are the kinds of things that keep renewing interest in the exhibition after you get beyond that opening weekend." The WSU Museum of Art's fall slate features a Northwest Alternative Comics exhibition, opening Sept. 26, that will showcase a slightly more modern art form than the Roman antiquities at Gonzaga. The show, Hardesty says, will explore "the rich history in the Northwest of comics, and particularly of the underground scene" that came up around Evergreen State College and the Seattle music explosion in the late '80s and early '90s.